When most people think of pumpkin, they instinctively assume a sweet seasonal dessert. It’s true, this pureed vegetable does make an excellent addition to any baked good, especially this time of year; however, I’ve been finding ways to look beyond my sweet tooth and use this nutritious ingredient in a more savory approach. Soup is one of my favorite dishes to make for the fact that it can be so versatile. This creamy pumpkin soup is rich and decadent but also packs in some worthy fiber from the pumpkin and white beans. Even though the title leads one to think this recipe calls for high-fat cream, the velvety texture comes from the surprising add-ins of pureed white beans and non-fat Greek yogurt. 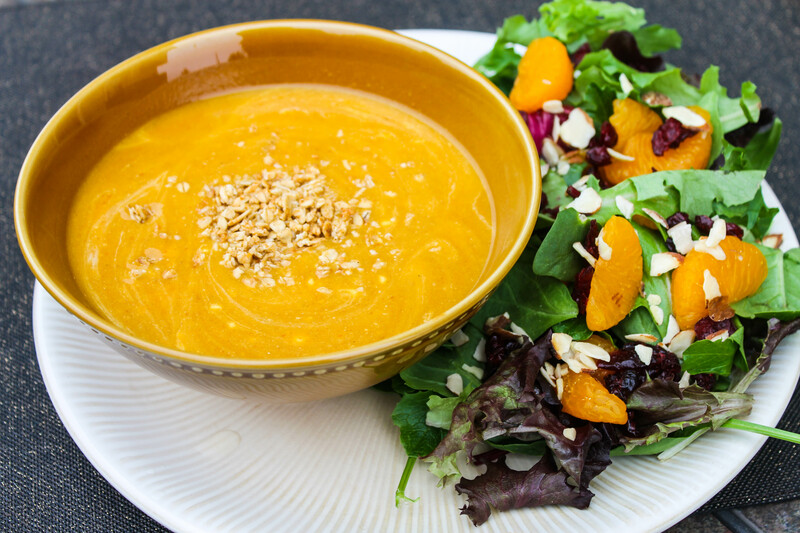 I’ll still be enjoying plenty of pumpkin-themed dessert this fall, but a hearty bowl of soup will give a nice balance for a savory change of pace. Heat oil in a large soup pot over medium high heat. Add onion, cook until tender, stirring occasionally, about 6 minutes. Stir in pumpkin, broth, beans and oregano. Simmer 8 minutes. In a blender, process soup in batches until smooth. Return soup to pot and reheat; season with salt and pepper. To serve, ladle soup into bowls and top each with a dollop of yogurt, swirl into soup. Yields about 1 cup per serving.